Fresh from his recent split with lingerie model Florence Brudenell-Bruce, Prince Harry was spotted recently whooping it up a Croatian resort. According to one report, the British royal had no shortage of female companionship for the evening's festivities. 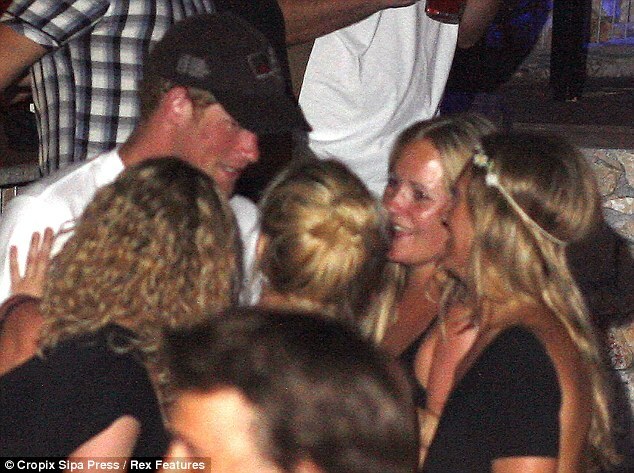 At one point the prince had the full attention of no less than four blonde girls and he didn't seem to mind the company. Alas, according to the Daily Beast, it appears that the night started to get away from Harry. At one point, Harry was dancing on the side of a swimming pool when he loses his footing and takes fully-clothed plunge. You have to give him credit: He does manage the make the plunge look more like a dive than a slip. The Royal Family is no doubt hoping the Prince is not too worse for wear. Fresh from his recent split with lingere model Florence Brudenell-Bruce, Prince Harry was spotted recently whooping it up a Croatian resort. It appears there may have been more to the break-up between Prince Harry and Florence Brudenell-Bruce. Contrary to reports from the Prince’s side of things, friends of the lingerie model are now saying that it was she was the one who dumped Harry to end the two-month long relationship. “She felt he had a wandering eye all the time and she wasn’t really into not knowing who he was flirting with or ­talking to when they were apart,” a source told the Daily Mirror in London. Originally, the word was that Harry didn’t want to be “tied down” while he pursued his military career that will likely take him to Afghanistan next year after some Apache helicopter training in the U.S. The turning point with ‘Flee’ apparently happened last month when the couple attended a music festival, according to the model’s friend. “At one point Harry was in an area of the festival known as the Tractor Shed flirting with another pretty blonde. Whatever the truth is in this he-said-she-said scenario, it's plain that Harry doesn’t seem to get too upset at this wandering love life. While vacationing in Spain last month he was spotted as several parties, chatting up the fawning females. Brudenell-Bruce’s unnamed friend told the Mirror there isn’t any bad blood between the two and they will still likely bump into each other on the party circuit. Neither will Harry. Betting is he’ll have made a few more conquests before he’s ready to follow his big brother to the altar. The Duke and Duchess of Cambridge lent their support to the people of Birmingham with a surprise visit to the city that was hit hard by rioting. The couple toured the area on Friday, close to where three people were killed last week and spent 15 minutes speaking with families of the victims. They then greeted emergency workers and locals at the city's Summerfield Community Centre. Mandy Sankey, nurse manager at Birmingham Children's Hospital, told the BBC the royal couple wanted to thank people in person for their hard work during the disorder. She said: "William said, 'we're sure you have already heard how grateful we are but we wanted to come here to say thank you in person'. "They seemed genuinely interested in how we dealt with it." Three men were struck and killed by a car as they tried to protect shops and homes from looters on Aug. 10. Haroon Jahan, 21, and brothers Shazad Ali, 30, and Abdul Musavir, 31, were buried Thursday during a funeral service attended by more than 20,000 mourners. The visit of William and Kate to Birmingham is the third consecutive day of visits by the royal family to areas affected by the violence and looting last week. His brother Prince Harry met emergency service workers in Manchester, northwest England, on Thursday and their father Prince Charles toured areas of London on Wednesday, including Tottenham where the violence began. Kate's outfit for the Birmingham visit was, as usual, a source of conversation. For the record, it was designed by her wedding-dress maker, Sarah Burton of Alexander McQueen. The nautical-themed outfit included a $950 blue skirt with a $1,200 McQueen cream blouse, according to the Daily Mail. If it weren’t for the red uniform and lace-covered dress, you might be hard pressed to identify this couple as William and Catherine. Not sure what it is with this pair, but doll designers must have a unconscious streak of nastiness when they sit down to carve their royal features. The toy company is selling this pair for about $160 (Canadian), with a small portion going to Britian’s search-and-rescue service. William seems especially cursed by the toy companies, and this Arklu version looks downright evil with its arched eyebrows, though the hair flatters him. Kate appears to a suffered some sort of scalp injury, but at least the smile on her rather oversized head gives her away. And what's going on with those eyes? Barbie and Ken they ain't. Of course, this is not the only questionable version of the wedded couple. Paradise Galleries has a $200 version (right), that also falls into the vaguely creepy category. With a little British humour thrown in, we hope. Crown Princess Victoria and her husband Prince Daniel are expecting their first child. Swedish Royal Court spokeswoman Annika Sonnerberg said Victoria, 34, is expected to give birth sometime in March next year. She said "the entire royal family is overjoyed for the couple." The court said no changes are expected to be made to the princess's schedule for 2011. Victoria married her private gym instructor, Daniel Westling, 37, in a lavish Stockholm ceremony in June 2010. While everybody seems to worry about Kate’s weight, there’s at least one person paying attention to Prince William’s waistline – his brother Harry. He has taken to calling his older brother “Teletubby,” reports the Sun in London. For those young enough to remember, “Teletubbies” was a kids show produced by the BBC and seen on PBS in the late 1990s. It featured a family of rather rotund beings from another planet. William, who gets plenty of exercise as a search and rescue pilot, has apparently packed on a few pounds since his wedding to Kate in April, perhaps a testament to his wife’s cooking skills at their home in Wales. The royal source says William has admitted to Harry that his wetsuit has become a bit too snug. "He may need a more forgiving fit but there is no suggestion he is really overweight,” the source told the Sun. "Kate loves it - she says it makes him cuddly." Brothers being brothers, Harry isn’t going to let a few extra pounds go unnoticed. “"He also asked his brother if he knows who has eaten all the pies. It's typical banter from Harry." Prince Harry and lingerie model Florence Brudenell-Bruce began dating in June. Prince Harry has split from his girlfriend. The prince has called time on his two-month romance with lingerie model Florence Brudenell-Bruce -- 'Flee' to her friends -- because he doesn't want to be "tied down" while he is busy with his military commitments. A source told the Daily Mirror newspaper: "Harry has a lot on his mind at the moment. He is concentrating on his Apache helicopter training. After that he's expecting to return to Afghanistan next year. "Harry enjoyed spending time with friends over the summer, but he doesn't want to be tied town in a relationship when training, so he called time with Flee." Just 10 days ago, it was revealed that Harry had introduced Florence to his brother Prince William and royal aides, and she had "gone down a storm" with members of the household. A source said: "Flee has been introduced to William and to palace aides, which is a significant step. "She has gone down a storm in the royal household. Harry's aides think she is sweet, funny and charming." Harry has just returned from vacationing in Majorca in Spain before returning to his Army Air Corps base, while Brudenell-Bruce remained in London. Harry's short-lived romance came on the heels of his break-up with long-time girlfriend Chelsy Davy, who was a guest at the royal wedding in April. Brudenell-Bruce's former boyfriend was Formula 1 driver Jenson Button. A royal spokesperson refused to confirm that she and Harry had split. Clarence House said: "We do not comment on Prince Harry's personal life." Prince Harry knew the Arctic was a dangerous place. That message rung loud and clear in his almost-frostbitten ears when he went on a 10-day Arctic journey in March. The third in line to the throne was on the last day of his trip with the Walking With the Wounded crew – a small group of injured British soldiers who were making a 260-kilometre trip to the North Pole. As the group stood near the top of the world, the group’s guide, Inge Solheim, noticed that the prince’s ears had turned white, a sure sign of impending frostbite. The ears went back under cover and Harry was thus saved from a tragic twist to the trek that was meant to raise awareness for the miltary’s wounded from Afghanistan. The resulting TV doc is called “Harry’s Arctic Heroes” and is being aired later this month in Britain. The prince trained with the nine-man group then spent several days on the journey that began at the Russian ice station Barneo. From there, he endured temperatures diving as low as minu 45C and hauled sleds across the frozen landscape that was anything but inviting. The dangers were real, which is why Harry didn’t even let his grandmother, the Queen, know that he was going. “My father (Prince Charles) obviously knew I was coming out here and so did my brother, but I kind of kept it quiet,” he said. “I don't know why it happened - so my grandparents and the rest of my family probably just found out about it and they probably think I'm completely mad. It's probably right." Charles was especially concerned for his son. "My father was very nervous because of the lack of training that I've done and quite rightly so,” said Harry. “He's got a lot of friends who have done this, he's got professional opinions that no doubt would have advised him saying 'do not let your son go'." Harry spent the first several days on the journey with the group before returning to civilization, where he had to prepare for his brother’s wedding and get back to his other military commitments as a helicopter pilot. The rest of the group finished their trip to the Pole in 12 days. The documentary gives some insight into Harry’s life, and his obvious affection for the military. “"I think I have three different lives - one's my military life, one's my private life and one's the sort of public stuff,” he said. "But, you know, me as a military man is probably my number one favourite because you get to some time with people like this -- it is very special." As if Kate Middleton weren’t slim enough, fashion magazine Grazia has finally admitted to airbrushing extra pounds off the Duchess of Cambridge for its post-wedding cover. The May 9 issue of the UK magazine shows a unusually slim Kate on her wedding day … minus Prince William. The magazine came clean in its most recent issue, blaming the journalistic faux pas on their reproduction house. Grazia explained it was looking for a picture of the bride on her own, “but all the photographs had the duke in too… so we asked our reproduction house to remove him from the picture. While doing so, the magazine’s editors narrowed her waist. When the magazine was challenged on the legitimacy of Kate’s slimmer look at the time, it denied wrongdoing. Following the special wedding issue, a complaint was made to the UK’s Press Complaints Commission, which has finally prompted the magazine to make a public apology for the “inadvertent” error. Scoop! Kate's having a baby. Or not. 1) Kate may already be pregnant. 2) Kate has had a miscarriage. 3) Kate is losing more weight. Wow. This Duchess is putting her body through one heck of a workout. Of course, there’s always the chance that one of these things is true, but the rumour factory isn’t necessarily worried about the legitimacy of the claims. Sell the sizzle, even when there’s no steak. There’s enough of an appetite (even if Kate doesn’t have one) to demand constant royal news ... even when there isn’t much, the digital universe is full of it. Privacy is not an option, especially for the royals, so most of the time they put up with the over-the-top stuff. Heck, they like to play the PR game as much as anyone. Occasionally, though, they complain to the British Press Complaints Commission if the imaginary line in the sand is crossed. The Middleton family, new to this game, are a little more sensitive. Pippa Middleton registered two harassment complaints post-royal wedding, both offending papers offering an “oops, sorry” mea culpea in response. Other royals are a little more touchy. Witness Monaco’s Prince Albert suing a French publication for rumours about a rift in his marriage to Charlene Wittstock. The regular gossip, like today’s searches, is almost harmless by comparison, though media credibility comes into question. As usual, it demands a discerning reader.